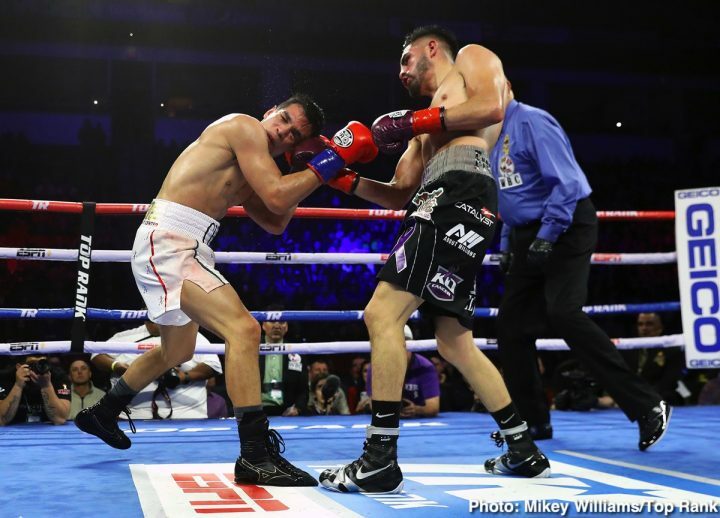 By Eric Thomas: WBC light welterweight champion Jose Carlos Ramirez (24-0, 16 KOs) just barely held onto his title in beating #14 WBO Jose ‘Chon’ Zepeda (30-2, 25 KOs) by a controversial 12 round majority decision on Sunday night on ESPN at the Save Mart Arena in Fresno, California. The judges scores were 115-113, 116-112 for Ramirez, and 114-114. Boxing News 24 scored it a draw at 114-114. The judge scored it 116-112 [8 rounds to 4] for Ramirez appeared to be watching a different fight than the one that took place inside the ring tonight. Ramirez landed 149 of 601 shots for a connect percentage of 24. Zepeda connected on 200 of 621 shots for a 32 percent connect percentage. Ramirez was getting out-boxed through most of the first six rounds. Ramirez, 26, came on strong in the second half of the contest after Zepeda gassed put. However, Ramirez was struggling with the slick boxing skills of Zepeda, who was clearly the better ring technician of the two. The scoring seemed to be tilted in Ramirez’s favor with the judges giving him rounds that he appeared to lose. It could be that the large pro-Ramirez crowd at the Save Mart Arena might have had an effect on the judges’ scoring, because the scores didn’t make sense. It was Zepeda that landed the more effective punches, but he was the B-side challenger, so he ended up on the short end of the stick. Ramirez did finish strong though, but he gave away basically most of the rounds in the first half of the contest with his ineffective pressure. Ramirez was just lowering his head and flailing his arms while trudging forward. The punches weren’t aimed, and there was little emphasis on defending. Ramirez didn’t fight like a champion. He was trying to bum rush Zepeda, and he was getting out-slicked by him. It’s not that surprising that Zepeda did so well. Four years ago, Zepeda was a guy that was well thought of in boxing circles. He was seen as a fighter with a bright future, and potentially a star in the sport. Unfortunately for Zepeda, he suffered a dislocated shoulder in his fight for the vacant World Boxing Organization lightweight title against Terry Flanagan in July 2015. There was talk of Zepeda getting a rematch as soon as his shoulder healed, but Flanagan moved on, and none of the sanctioning bodies gave Zepeda a high enough ranking for him to get a title shot. Despite winning seven fights in a row, Zepeda wasn’t pushed up in the rankings. The only reason Zepeda got a title shot tonight was because Top Rank picked him out, which was a generous thing for them to do. If not for that, Zepeda likely would have been toiling away for ages without getting a crack at a belt. As we saw tonight, Zepeda was more than a match for Ramirez. Zepeda looked and fought he was the champion, and Ramirez was the unschooled challenging. The casual boxing fans that aren’t familiar with Zepeda, might think he’s some guy that materialized out of nowhere, and was just a nobody. That’s not the reality. This guy was star material until he suffered a shoulder injury in 2015. You’ve got to feel more than a little sorry for Zepeda. His first career loss to Terry Flanagan was a result of a shoulder injury. If not or that, he likely would have easily beaten Flanagan. Ignored by the sanctioning bodies, Zepeda finally gets a title shot in a voluntary defense by Ramirez, and he ends up losing a controversial decision in a fight that he either deserved the victory at at the very least he deserved a draw. Instead of Zepeda having a 30-2 record, he arguably should have a 32-0 record or a 31-0-1, but he still hasn’t been beaten in the true sense in this writer’s view. Ramirez was putting a lot of pressure on Zepeda throughout the fight, and throwing punches that were missing and/or blocked. Ramirez was walking into a lot of shots throughout the entire fight. He was making it easy for Zepeda to tag him as he was coming in. Zepeda did a good job of out-boxing Ramirez through the majority of the fight. It was always going to be tough for Zepeda to earn a decision with him fighting in Ramirez’s venue. Zepeda is ranked low by the World Boxing Council at #14. That had to have hurt his chances of winning a decision as well. Overall, it was not a good performance by Ramirez, who looked very beatable against a bottom feeder in the 140 lb division. Ramirez and promoters at Top Rank need to think of what direction he can go in, as soon as he’s forced to defend his WBC title against Regis Prograis or Josh Taylor, it’s very likely going to be the end of his title reign. Prograis arguably made a mistake in taking part in the World Boxing Super Series light welterweight tournament. Had Prograis not joined up with that tourney, he likely would have already fought Ramirez by now, and beaten him soundly. It would have been a better deal for Prograis to have won the WBC belt ages ago rather than spinning his wheels in the WBSS tournament, and waiting ages for his fights and not knowing what’s going to happen with that tourney. If Ramirez moves up to 147, he can get an immediate title shot against fellow Top Rank fighter World Boxing Organization welterweight champion Terence Crawford. At least that’ll be a good payday for Ramirez. It’s unlikely Ramirez will beat Crawford, but the pay check will be good, and likely than what he’ll get in defending his WBC title against Prograis or Taylor and losing to them. Ramirez has a nice story behind him, but he’s a limited fighter, who clearly has very little time left as the WBC champion. He’s not going to be able to milk his title for too much longer once the WBSS is over with.